»Bee in the Word»Plumb Right!!! It has been a while since I’ve posted. Life has been crazy hectic for everyone these days. I’m pretty sure that satan is keeping everyone quite busy because He wants us to have distractions that get even thee most seasoned Believer off course. Nothing new, right? There is coming a time when his come-up ins from Jesus are coming. In the meantime we are to be aware, fully aware, fully guarded, and fully clothed with all that armor as it’s open season on anything, anyone, and everything. This, these thoughts are why I’m sharing today, and posting just what He gives me to share. I know I’m not every persons cup of Jeannie. I am however, obedient, and so here we go. Read along, share, comment, repost on your Facebook if you dare. I know I’m no major popular speaker, let alone writer. Most of what I’m sure I say, is said better by someone else later. That doesn’t matter to me though, if Jesus leads me to do it, I’m going to post it. There are a few people who’ve encouraged, allowed me to be me with my grammar flaws and all, and to you, I’m most appreciative. Truly I know how Paul felt when those whom He walked with, left him standing some-what alone. I say some-what because Paul, like all of us, always has our unchanging Father GOD beside us to guide us. Like Paul, there are a few ladies and gentlemen who’ve also written me when I don’t write and say they miss my sharing. That I have a way about me that might not be the popular thing, but if it even touches one ♥, one soul, one mind, don’t “we matter”? Yes, yes you do, because that is the theme of the day today. You and I, we are one. We just forget that. We just decide that those who wind up with the perfect pitch get to win the masses and the game. I’m not that woman, never will be, don’t want that sort of claim to fame. I don’t want to sell books, sell something on my blog, or be the woman who people remember. Being remembered would be nice. I’m learning lessons how forgotten by people feels lately. I have a family that has disowned me, sisters whom I love who’ve decided that I’ve never been born. I’ve run into people from a former job whom I daily worked side by side by, and they say things to me like, “Do I know you? You look familiar but I can’t place you.” Does that hurt? Sure it does. It hurts only in the sense that these are people I’ve not forgotten about. These are people I still love. And while some are still willing to play games, GOD is saying enough already. It’s time to get the plumb line out and see who measures up. Anything out of plumb is not centered. Do you know what a plumb line is? I know because my first husband was a carpenter. Funny yes, cause Jesus was a carpenter. You think there is a reason GOD chose this profession for His Son? I do! A line from which a weight is suspended to determine verticality or depth. 2. A line regarded as directed exactly toward the earth’s center of gravity. I’m thinking that maybe if someone is going to make some sort of jewelry for a Bible Believing CHRISTian to wear it should be a plumb line. In fact I’m not a jewelry wearer but I’m thinking just maybe I’ll make something like this and wear it. I’m not going to wear it because it shows the world who I am though. I’m going to wear it because it displays for me a reminder of who I am suppose to be. Times are getting tougher and tougher. People in the Body are forfeiting what is solid Biblical Truth for popular speakers, teachers and preachers who water down the Word of GOD. Sure I know that this has been going on for generations, but these times are not the times of old. These times we are living in now, they are the times of decision making alright. 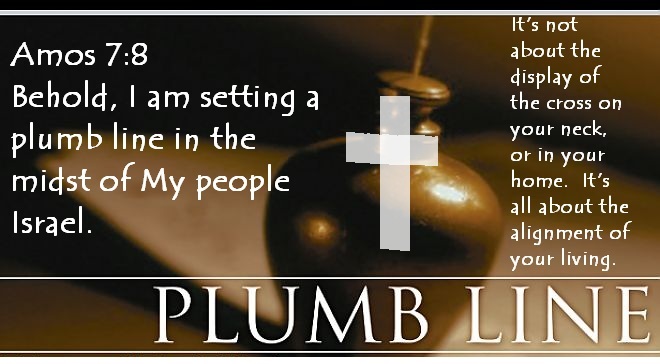 Get out the plumb line of His Word. What you and I are right now could be measurably more. Don’t allow someone else and their watered down standards, beliefs and ways to be living this life for Christ, how you decide to direct the steps of your life. Don’t allow someones twisted version of His Truth to be what you align up with. Just because it sounds good, feels good and all is going good for you, or the person who’s telling you something you know, know, know is wrong, and things are just going super-duper for them, that doesn’t mean they are living some blessed and bountiful rightful life. Truth is, if it doesn’t plumb line up with the very Word of GOD it’s out of alignment. Not I, but the Grace of GOD! I have to also share that I’ve been some hefty mistakes in my life. I’ve made choices that if could be done over, I’d do differently. Believe it or not, wait for it… I’ve been wrong! LOL Really though, I’ve been wrong, I’ve wronged people. Sometimes it was because I was stubborn, sometimes it was because I was hurt, sometimes it was because I was immature and wouldn’t compromise over something that can be comprised. There are times though, times that I’m proud of living, even if it meant a whole lot of people didn’t understand the choices I made. All that matters is that I didn’t at those times do it my way, I did it the way He directed. Today, as I was reading Paul’s words about people making choices in not standing up for him, I truly understand the place he was coming from. Amazingly Paul actually said they’d be accountable. This goes for me as well. If I do not stand up for someone in the Body who is being wronged, I fail GOD, I fail them. Every time we see someone in the Body be beaten down in any way, especially by those in the Body, wrongly, and we choose to do nothing, to turn a blind eye, we are just like those who turned a blind eye to Paul’s situation. Every time we don’t stand firm on the Word, and keep thinking “what will people think of me?” we’ve chose to get our plumb line, lined up not with Christ, but with the world. Next time get the plumb line out. Next time make sure that it isn’t about your rep, but the reputation of that GOD-age old Truth, and nothing but that Truth, so help us GOD!!! The ultimate “peace” of Christian plumb line jewelry is the cross! And you have it exactly right-people aren’t supposed to be wearing crucifixes as an outer display, it’s supposed to be a reminder to ourselves! Some people have definitely “golden calfed” the idea, wearing the big, gawdy, ornate crosses, but that’s not what it’s supposed to be about. And don’t get me started on crucifix tattoos – that’s a complete oxymoronic concept if ever there was one! I live in The Bahamas. This writing is so on time for what is happening in the world today. Thank you. Be encouraged and listen, Jesus stood alone when the disciples left the ministry. 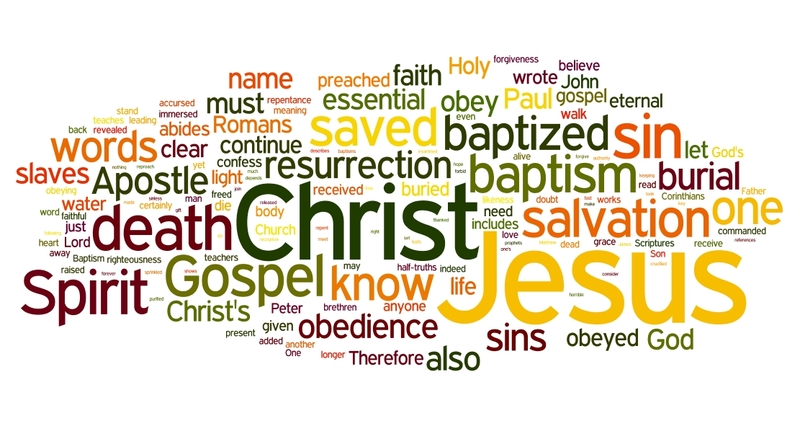 But, Jesus knew that Father God did not leave or forsake the Lord’s own. Thank you. All to Him I owe.